New York facts - Good to know before you leave. Here you will get some facts about New York. Good to know before you leave. The official language is English but here is also a big mixture of different nationalities and these languages are for example: Spanish, Italian, Greek etc. You can visit New York when ever during the whole year. You only have to know by yourself which weather you like the best. During the summer (Jul-Aug) it can get really hot and winter/spring can be really cold. Even if you are looking at the temperature in winter there are not many degrees below zero - but the wind between the high skyscrapers will make the temperature significant colder. Beside you have an approx scale over the temperatures in NYC per month. During public holidays most banks, offices, some shops and a few museums are closed. Presidents' Day - Washington´s Birthday (Feb 20 -Third Monday in February). Honor the President Washington, but the day has been expanded to honor all presidents. Memorial Day (May 29, 2017 - last Monday in May). To remember all those who died while serving in the country's armed forces. Independence Day (July 4 )The day is celebrated in memory of the 13 North American colonies July 4, 1776 declared itself independent from Britain as the US Declaration of Independence ratified by the Continental Congress. The document is now on display in the National Archives in Washington, D.C. The day is celebrated with a huge fireworks display that Macy stands for. The fireworks are launched from barges located on the East River and can be seen from any unobstructed views of the East River in Manhattan, Queens and Brooklyn. The event is of course free. You can stand at 42 nd Street, 23 rd Street, above the Williamsburg Bridge and down at the Brooklyn Bridge (Pearl Street, Frank Front Street) South Street Seaport and of course on the Brooklyn side. Labor Day (Sept 4, 2017 - first Monday in September), unions that organize demonstrations. The day is followed by a Labour Day parade on upcoming Saturday. Columbus Day (Oct 9, 2017 - second Monday in October)Celebrating the anniversary of Christopher Columbus' arrival and the discovery of America, which took place October 12, 1492. Thanksgiving (Nov 23, 2017 - fourth Thursday in november). A day to give thanks for the blessing of the harvest and the previous year. Celebrated with among others Macy's Thanksgiving Parade. It was President Abraham Lincoln who decided in 1863 that this day would be a day of celebration and gratitude. Christmas Day (25 dec) The celebration of the birthday of Jesus Christ. Other days that are celebrated in the United States are good historical days, days in honor of people or a special person or days with thoughts of given religion. Some days have come to by various reasons. and Macy always perform a simply spectacular flower show in its department stores. To eat brunch is usually a social event about Easter. Tartan Day (Saturday April 8, 2017 - celebrated some time early, mid April).Celebrating the Scottish Declaration of Independence in 1320 and the legacy of Scots to the Americans. Tartan Day is also celebrated at Ellis Island on April 9.
to bombard a stranger or a friend with pillows. Participants in the International Pillow Fight Day New York asked to wear a funny outfit and bring garbage bags and brushes to clean up after the fight ends. deployed in overseas operations dock in port for a week. In NY, the public can take a guided tour of the ships, etc. It will air shows across the city and much more. (June 25, 2017) Gay Pride Parade begins at 36th Street and Fifth Avenue and ends in the West Village. HBTQ`s culture, community, the focus on this day. Halloween came to United States during the 1800s and were later merged with several other countries' traditions to be a day of joy instead of a dark day. New York's Village Halloween Parade in Greenwich Village is celebrated this day. 9/11 (honor the memory of those who died in the terrorist attack). Tribute in Light lights up next to where World Trade Center stood. There are two powerful headlights that shine straight up in the air. Black Friday (Nov 24, 2017 - Friday after Thanksgiving in November). The big shopping day with huge sales in many stores. Nyårsafton (31 Dec) The day when the old year ends and the new year begins. Big celebration with fireworks at Times Square etc. Salute to Vienna / Salute to Vienna with music by Johann Strauss Jr. in Lincoln Center. ESTA - apply before you travel to the US.! To enter the US, you need to pay a fee for admission. (Swedish citizens do not need visas to visit the United States if not exceeding 90 days). You apply and pay online before you travel. Upon entering the us your your passport is checked on your application number. Your application will usually be finished within 5 minutes. Children without parent or guardian shall also apply. Apply no later than 72 hours before departure. You pay with your credit card. You fill in your passport details, flight details and other issues, etc ... You will not get any confirmation via email or any documents to save for your application. On the screen pops up your application number, write down your number or take a "print screen". April 1, 2016 have an e-passport. Here you can see which countries are included in the Visa Waiver Program. 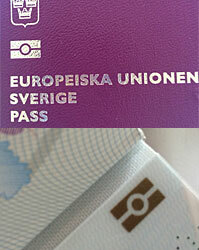 E-passport is issued with a special symbol that looks like an old picture of a camera. In a Swedish passport the symbol is located on the front page and also on the page where your persnoal data is located (top right corner). An e-passport with an electronic chip contains the following: all data contained in the machine-readable zone on the bottom of the passport page on which all personal data are, fingerprint, signature and a digital photograph. Children must also have its own e-passports. Save your number, you might use the same number again! To get to the Police, Fire department and Ambulance, call 911. 445 Park Avenue mellan 56th Street and 57th Street. Times Square: Times Square Information Center - Seventh Avenue (between 46th and 47th Streets). A really good place to start your visit in New York and collect information about what´s going on in town. Chinatown: Kiosk - in the street crossing Canal, Walker och Baxter Streets. luggage at the hotel, etc. This help is between 1-5 dollars in tip. Other assistance little more. 110V AC - electrical outlet (with two flat straight outlets). Bring with you an electrical adapter. Lots of hotels, cafes, libraries, restaurants, parks, subway stations and shops around town are WiFi enabled. Around Times Square there are connections that include easyInternetcafe (7th Avenue),Even ordinary cafes offer wireless Internet access for your laptop. The coffee chain Starbucks provides of course free wifi. Several subway stations are connected to WiFi. The city is working on that all stations should be connected by the year 2017. More information about free internet in subways in New York. You can of August 2006 surf wirelessly in some parks and then at selected locations in each park. Parks included are Washington Square Park, Central Park, Riverside Park and Prospect Park (Brooklyn), Battery Park. This is absolutely free. More parks will be added. New York has begun to establish Wifi stations in the old phone booths. This allows users to download what they need, look up reviews for a nearby cafe or just check their e-mail. These stations will be called Link. Each link has a range of about 245 feet and can accommodate 500 users. LINK NYC kiosks also provide free phone within the US and USB ports to charge your smartphone. Each phone booth in New York (about 10 000st) shall be rebuilt and ready 2028. The goal is that all of Manhattan should get access to connection 2028. Many inhabitants today in Manhattan can not afford the internet - this service allows many more will receive free access to the Internet. In addition to privacy LinkNYC will also be among the most secure Wi-Fi network available. It will be one of the first public encrypted networks - unencrypted wireless traffic will disappear. Tips if you are several people at the same time in New York: Do you have phones that are not locked to a specific operator get an a temporary SIM card/prepaid card in New York. You get a new phone number that can be used only in the United States. Good thing is that you can call and send text messages to each other for a fixed cost. Remember: you will not be reached on your ordinary Swedish mobile number. It's great with American prepaid card in New York if you make or receive a call from phones in New York. Keep in mind that there will be significant costs if you receive or make calls to Sweden. The sum on the card runs out fast! use it only in New York. Age limit to buy and drink alcohol is 21 year. Beer can be bought in food shops but alcohol can only be bought in special shops. There are not so many public bathroom in the city. The best thing is to visit some cafe or restaurant. MC Donalds and Starbucks can also be found at several places. Can be good to also buy something as a thanks for the visit. Smoking is forbidden at most public places and buses, in the subway, in a taxi, office buildnings, shops, restaurants and bars. Check how it is were you are located. Why is New York called "The Big Apple"? The first time you could see the word in printing was during 1930´s and then it was written by John Fitzgerald in the newspaper the Morning Telegraph. He was a sports journalist and had heard some stable workers talk about different horse track in New York as "the Big Apple" - they liked to come to New York and they saw the city as a place for a lot of money and loaded with opportunities - the Big Apple. The biggest apple on the tree of fortunes. Later on the jazzmusicians used the name. The district Bronx - how Swedish is it ?